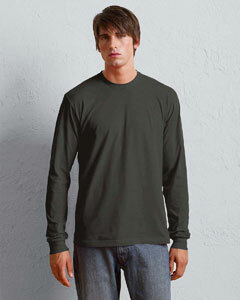 4.3 oz 100% combed ringspun cotton jersey; heather is 90/10 cotton/polyester blend. Set-in sleeves; baby rib collar and cuffs. Ribbed cuffs means the sleeves won't roll up on chilly days. Great fit, perfect to slip over a tee. Long-lasting durability. "Shirts were much longer than expected, but it's okay (you're lucky oversized clothing is a trend right now lol) :) The shirts are super soft though, fingers crossed they wash well :) Can't wait for our newspaper staff to wear these! Thanks for being so helpful and communicating well, keep being awesome!"